The Super Eagles of Nigeria face Senegal and Burkina Faso on Thursday, March 23 and Monday, March 27 respectively in London. 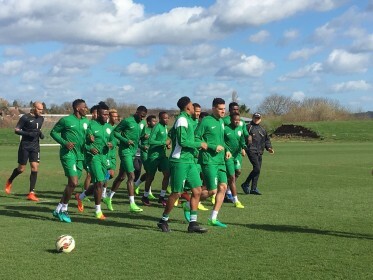 Ahead of the friendly games, the Super Eagles camp opened on Monday, March 20 at the Crowne Plaza Hotel in London. The training session, which is the only one for the day held at The Hive (home ground of Barnet Football Club), London where both friendly games will be played. A host of Super Eagles players after the training took to social media to share photos from the session. “First training session done.The future is bright for our football .Too many talent here,” midfielder John Ogu wrote on Twitter. “Always good to be back with the team, everyone looking sharp and fit this morning,” Kelechi Iheanacho wrote. Currently in camp are Chidozie Awaziem, Isaac Success, Ogenyi Onazi, Carl Ikeme, Bazee Noah, Alex Iwobi, Simon Moses, Wilfred Ndidi, Shehu Abdullahi, Ahmed Musa, Kelechi Iheanacho, Leon Balogun, William Troost-Ekong, Moses Simon, Wilfred Ndidi, Ahmed Musa, Tyrone Ebuhehi, John Ogu, and Kenneth Omeruo. Chelsea star Victor Moses has returned home because of a calf in injury. He joined his international teammates at the hotel on Monday but returned home the following day after the Super Eagles medical team confirmed the injury.